Our Work » Team Blogs » Chemical Crave: Is My Food Safe? Chemical Crave: Is My Food Safe? It may no longer be common for women to use ceruse, a white lead and vinegar mixture, on their face, or vermilion, made from mercury, on their lips, but that doesn’t mean dangerous chemicals aren’t still in our consumer products and, alarmingly, even our food. Traces of lead, for instance, are still found in makeup, while formaldehyde and flame-retardants are found in children’s products. When it comes to food, people often think if it is safe to be sold, then it is safe to eat. However, because the Food and Drug Administration (FDA) is in charge of ensuring our food does not poison us, as opposed to making sure no chemicals are present whatsoever, oftentimes these products contain chemicals that can lead to long-term health consequences. Roughly 80,000 unregulated chemicals are on the market today, untested for safety, and found in snacks like chips, ice cream, and even boxed mac and cheese. The situation has gotten the attention of U.S. Senator Chuck Schumer who recently called on the FDA to investigate chemicals in fast food packaging that could leach into food and be ingested by consumers. In a bit of heartbreaking news for ice cream lovers like me, news broke recently that Ben & Jerry’s had traces of the herbicide glyphosate in their ice cream. I eat a lot of ice cream, especially Ben & Jerry’s, so, like most people, my reaction started with confusion, then disgust, and finally anger. It’s shocking that I, and many others, have unknowingly been eating such harmful chemicals from a company that has committed itself to being environmentally friendly. This news was preceded by a New York Times report that detailed the existence of phthalates, an endocrine disrupter, in twenty-nine out of the thirty tested cheese powders for various boxed mac and cheese products, including Kraft (another favorite). In other words, never assume food is safe. One way to keep ourselves healthy is through the implementation of a comprehensive food safety policy in New York and the United States. While a great deal of scientific tests, studies, and reports are occurring, we know that science is often ignored by those in charge, which is how we end up with chemical contaminations. For example, glyphosate (found in the weed killer, Roundup), has been identified by the International Agency for Research on Cancer (IARC) as a probable carcinogen, yet is still somehow ending up in our food. Furthermore, IARC has indicated a connection between this chemical and non-Hodgkin lymphoma. Phthalates, (the family of chemicals to which glyphosate belongs), which may pose a greater risk to pregnant women and young children, are linked to genital birth defects in male infants, and can also disrupt their testosterone levels. Behavioral issues and learning disabilities are also linked to phthalates. This is all part of the bigger issue of how and why these chemicals are ending up in our food. Unfortunately, chemical contamination is not limited to ice cream and mac and cheese. A 2011 study by the U.S. Department of Agriculture found that of 300 soybeans tested for glyphosate, 271 of them tested positive. Glyphosate has also been found in certain brands of pita chips, Cheerios, and Ritz Crackers. 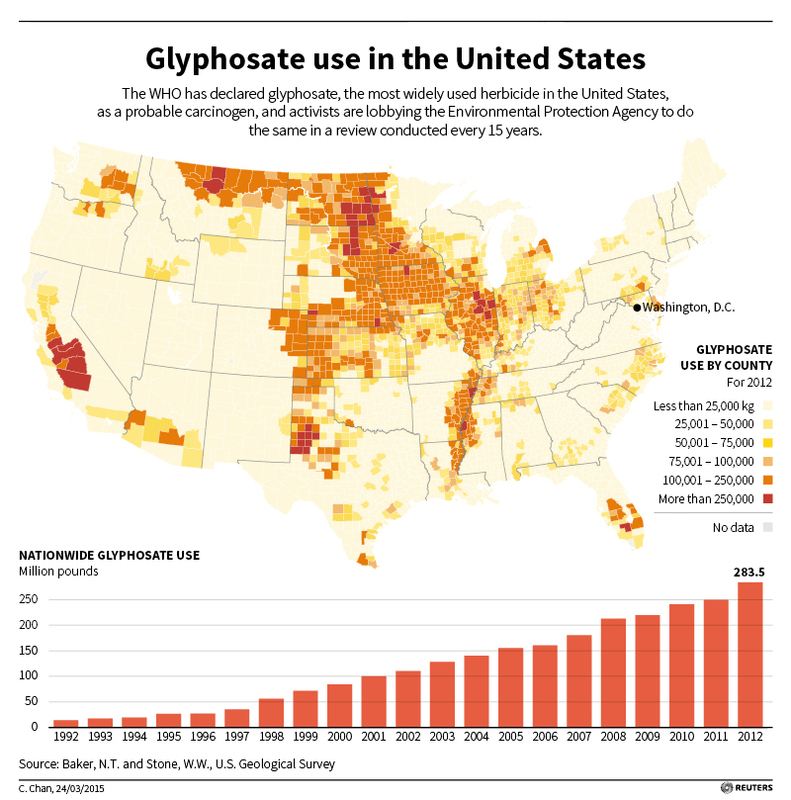 It is no wonder that the World Health Organization states that glyphosate is the most widely used chemical in the world with at least 283.5 million pounds sprayed on farms in America, as noted in a U.S. Geological Survey. Thus, the risk of contamination is exceptionally high. The “upside” of these recent exposures is that it gives new momentum to the push to strengthen our state chemical oversight and food safety policies. We are up against a powerful industry, one that now has the ear of President Trump and his EPA chief who refuses to follow science. Personally, the most distressing thing about these contaminations is that Ben & Jerry’s is an environmentally-mindful company that advocates on behalf of environmental issues. Yet even they fell victim to the presence of glyphosate. Imagine how other, non-mindful companies, who do not share Ben & Jerry’s commitment, operate. This all speaks to the pervasiveness of chemicals in our society, and sheds light on how pesticides, in particular, can end up in foods we least expect. In addition to Environmental Advocates’ work protecting water supplies and enhancing regulations on the chemical industry stemming from our work in communities like Hoosick Falls, Newburgh, and Long Island, we are in the process of developing a food policy program to begin to fill in the loopholes and glaring omissions within law. We invite your expertise. Do you know of an organization, or policy, that is making a difference on the farm-to-table front? Then email me at cobrien@eany.org! I look forward to hearing from you.